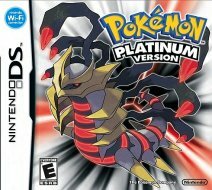 Pokémon Platinum is the third game in the Diamond & Pearl series. It is for the Nintendo DS. The star Pokémon is Giratina, in it's exclusive Origin Form which replaces Dialga & Palkia as the main Pokémon that is hunted by Team Galactic & captured at the Spear Pillar. This includes the re-introduction of the Battle Froniter, the inclusion of the area called the Distortion World, where Giratina lives. In addition to these new areas, Sinnoh itself has received a dramatic aesthetic update with a massive climate change in the North East and South West of the island. 60 more Pokémon are obtainable straight away in the Sinnoh Dex, allowing for a massive change in trainer rosters and wild Pokémon across Sinnoh. The Wi-Fi Features have also been vastle improved. There's a new Wi-Fi Plaza area for random play with other players, playing Mini-games and interacting. As well as that, there are new features in the standard area that is allowing each player to create Poffin or battle through the Battle Frontier.